The concept of a selfish miner ‘attack’, all started with a paper by Cornell University researchers Ittay Eyal and Emin Gun Sirer, titled “Majority is not Enough: Bitcoin Mining is Vulnerable”. The idea on the surface seems to make sense. A “selfish miner” who discovers a block, can choose to keep the discovered block a secret. By not propagating the block, the miner keeps a local copy of the forked chain. All other nodes on the network, continue to mine on the public chain, while the selfish miner, continues to mine on its private branch. If the selfish miner discovers more blocks, then it develops a longer lead over the public chain. Eventually the public chain (which has more hash power behind it) catches up to the private chain, the private chain can immediately time its release of the private blocks to the public (having the longest proof of work). The method is designed to force opposition miners (honest miners), to waste computations on a chain branch that is destined to not become a part of the blockchain record. “Selfish Miners” do this by selectively revealing their mined blocks that invalidate opposition (public) mined blocks. It does beg the question however, if Selfish Mining is really a thing, can’t all miners adopt the strategy? Wouldn’t all miners adopt the strategy in this case? Indeed, if all miners follow the algorithm as set out in the paper, then any perceived advantageous benefit is lost. Since the release of the paper in 2013, the “Selfish Mining” saga has gone through endless debate cycles, and particularly, only recently has flared up once again. Dr Craig Wright in particular has been loud in his criticism of Selfish mining, dubbing it a fallacy. Does the criticism hold water? In a medium post, Wright went into detail on his position. 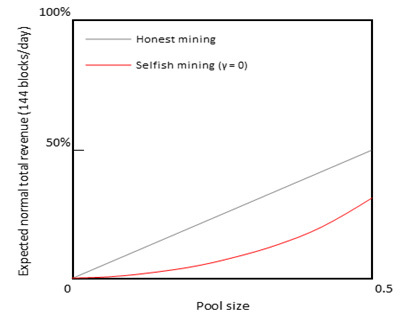 Wright states that selfish mining “relies on the relative percentage of blocks earned by a particular miner. It does not consider the number of blocks to unit time”. Also “their state model is based on a fixed average that does not account for orphans or the simple notion of revenue per unit time”. A simple, assessment of the paper leads us to categorically state that this assessment is correct. An interesting point also noted by Dr Wright is that “profit is the additional reward for earning and at a certain point, more revenue leads to lower profit levels”. Simply put, more revenue does not necessarily equate to more profit, and that an equilibrium exists where the best profit for investment can be attained. But how does it change the course of the study? Wright further states that the “very model used in selfish mining is itself flawed”. In particular, he raises the question of the Poisson distribution used which expresses the probability of a given number of events occurring in fixed intervals of time and independently of the time of the last event. The Poisson distribution only works if the model is independent and identically distributed. The selfish mining model however, is conditional, since the selfish miner reacts after the discovery of a block from the honest miner. Case in point, this does throw into refute the mathematical model used in the paper. What model should’ve been used? According to the medium post, an Erlang Distribution or Negative Binomial Distribution. The below figure is from the 2013 paper by “IttayEyal and Emin Gun Sirer”. It illustrates the revenue model according to pool size for the selfish miner. 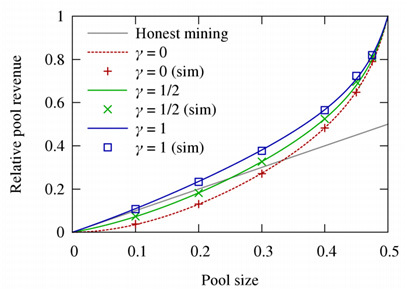 Interestingly in this model, at no point does the selfish miner get anywhere near the baseline of an honest miner. But Wright makes another interesting point here… that even when using the using the selfish mining strategy without addressing the flaws in the model, the gross return still falls short for anything under 50% of the hash power. Ofcourse after 50% it doesn’t really matter, since at that point Bitcoin is effectively centralized in any case. But it’s an interesting point to posit. But the thing does become compounded when incorporating the additional block orphans which take a direct toll on profit, for which the calculations on the medium post showed stunning daily losses. Dr Wright states that to correctly analyse things, a time censored Bayesian model would need to be created and that he will release the mathematics involved in all of this in the near future.